It's the ubiquitous tool found in nurseries, hospitals and homes across the country: the nasal aspirator. 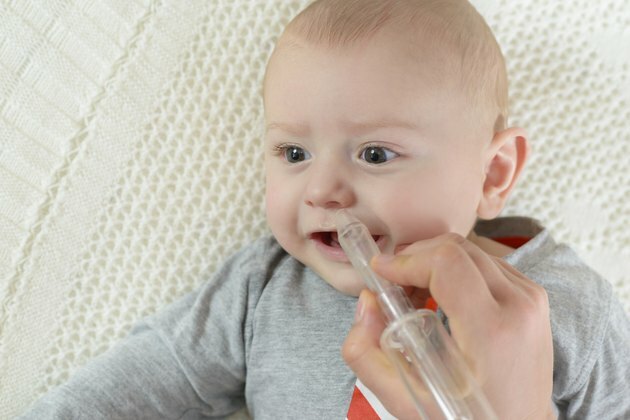 Known commonly as a bulb syringe or nose sucker, it's used to relieve mucous in babies who don't yet know the art of blowing their noses. Before you use a bulb syringe on your congested babe, ensure you're using it properly. Being too aggressive or using it improperly could be dangerous to your little one's sensitive nose. The tissue lining your baby's nose is extremely thin and delicate. Thrusting the bulb syringe too far or being too aggressive with the suction can result in nosebleeds, thanks to ruptured tissue. The damage can be mildly painful to your little one and can also make it difficult to aspirate in the future -- you could continue opening a yet-to-be-healed wound each time you use the syringe. Use an aspirator with a safety ridge, instead. It has a clear delineation of how far the syringe should be inserted and is so large in diameter that it's impossible to push it too far into the nostril. If you have to use the nose sucker repeatedly, it could result in the swelling of the membrane inside the nostrils, according to the Children's Hospital of the King's Daughters. Use the nose sucker only when necessary and make each suction more productive by putting your little one in a steamy bathroom for a few minutes beforehand. It'll help loosen the mucous so you only need a few suctions to help clear up your baby's nasal passages. If you have more than one child, you could be spreading germs when you use a dirty bulb syringe. Mucous carries germs that can live on the hard surface of the syringe for up to 48 hours, warns MayoClinic.com. After each use of the bulb syringe, douse it in warm, soapy water for a few minutes and then allow it to dry before your next round. That ensures the germs from one child aren't transferred to another. The nostril sucker can be a safe tool to use to help your baby breathe more comfortably as long as it's used safely. Use saline drops or steam to loosen the mucous e for a few minutes before using the bulb syringe. Hold the aspirator between your thumb and forefinger, depressing the bulb with your thumb. Insert the tip gently in your baby's nose, taking care to not press the end against the nasal walls. Gently release the bulb and remove the tip, cleaning between each use. If your baby's nose bleeds or becomes irritated, discontinue use and talk to your pediatrician about other ways to make your little one more comfortable with a stuffy nose. Safety versions and even battery-operated aspirators can also be used -- follow the manufacturer directions exactly. Can I Use Table Salt in a Neti Pot?